The four concerts in the “Brahms and the Art of Film” week are the opportunity for the OSM to present four new creations: three works for orchestra, commissioned to three different composers – Blair Thomson, Zosha Di Castri and Régis Campo –, and a film created by the young filmmaker Mathias Arroyo-Bégin. 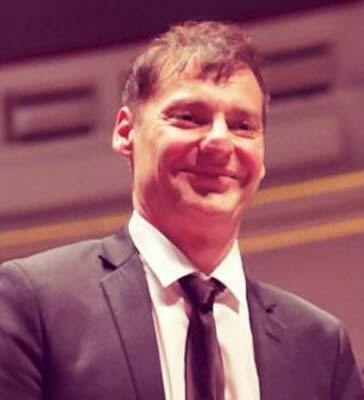 The musicologist Gabriel Paquin-Buki conducted interviews with each of the creators. Gabriel Paquin-Buki’s interview with the composer Régis Campo, joined in Paris, January 18 2019. You had to choose between several NFB short films, and you chose Nails, a 1979 movie by Phillip Borsos. Why? One senses true energy in this documentary in which a nail-making factory is revisited. Its effect is like that of a heartbeat, of a human body’s inner life. This seemed to align well with my music, which is very often based on pulsations, and on rhythmical and emotional energy. In this project, the OSM wanted to explore the relationship between two art forms that are frequently in dialogue, but rarely require rewriting the music to a decades-old film. Describe your creative process. I viewed the images time and again, striving to fully absorb the life and tempo of this factory. When I was watching this short film, I would mute the sound to try and imagine my own music. Then, I began to compose without watching the documentary but trying to retain its raw energy. As early as 1927, the composer Alexandre Mosolov’s Iron Foundry sought to render the mechanical movements of machines in Soviet factories. But my aim, with my work Heartbeats, was to add the element of free spirit, with a playful and even happy quality that I associate with the 1970s, the decade during which Nails was made. At times, I use rather strange orchestrations; for example, the sounds of percussion instruments to achieve the effect of certain machine noises with their repetitive movements, like patterns that keep spinning. At the outset of my score, I added the indication, “with exuberance”. There is a form of jubilation, of folly that overwhelms us at the sight of these images of nails being manufactured without end! Every project with Maestro Kent Nagano calls on everyone to join forces and produce something original and extraordinary, and to offer Montreal audiences something completely atypical. A project such as this one is uncommon; what kind of challenges might one expect? The greatest challenge is to succeed in making the music really fit the images while remaining both very simple and sophisticated. The music must follow a natural process and give the images enough space to breathe and be effectively deployed. My passion for film music has taught me that music often supports the image, and to do this well, one must begin with very simple motifs. I feel this is the case with Heartbeats because when all is said and done, I built the score on only seven chords that obsessively unfold in the same sequence, like the Passacaglia in Brahms’ Fourth Symphony, where the composer’s mastery is expressed in his ability to vary the music using very sparse thematic material. And I really do like the motive used here throughout my work, which is based on the interval of a major third. It’s funny, because I only realized afterwards that the last movement of Brahms’ symphony, which is my favourite movement, really supports the spirit of my work. Heartbeats follows a dramatic trajectory from crescendo to crescendo, culminating in a great orchestral tutti. What techniques did you use for the synchronization between the orchestra and the film? I have opted for great liberty in synchronizing the music with the images. The music starts at the very beginning of the film, but there are moments, fermatas if you will, that allow the Orchestra to breathe. Thus, the synchronization is not absolute and will not prove too constraining. The music of the film Alexander Nevsky by Prokofiev comes to mind: this is music that can very well be listened to independently of the moving images. In cinematographic works, I like music that “flows” through the complete trajectory of images and scenes changes. This comes through, notably, in the magnificent films of Terrence Malick, who very adroitly uses classical and contemporary music, as does Stanley Kubrick. I do have something important to say. I want to dedicate my work to Maestro Kent Nagano and to the musicians of the OSM whom I admire enormously. Through this creative exercise I wanted to pay tribute to many of the orchestra’s chairs. The OSM is an amazing orchestra that has embraced new works by today’s composers. This orchestra’s heart beats along with the heart of our times and of our lives!